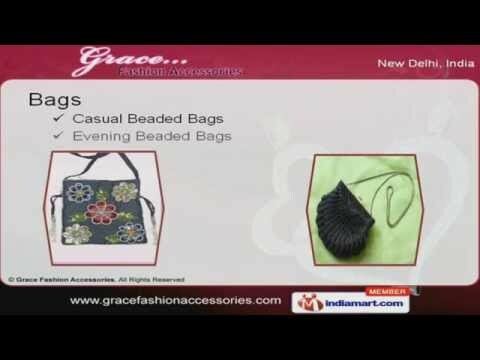 Welcome to Grace Fashion Accessories, where we offer excellence in every endeavour. Manufacturer and Exporter of Designer & Bead Jewellery.Incepted in the year 1997, we offer wide range of quality products. Archies, Big Bazar, Hero Motors are some of our esteemed clients and we have major markets in Dubai, USA, Chile and other countries.Our Excellent style, Exquisite designing, texture and quality has helped us to become a leading name in the industry.We offer a splendid range of Fashion Jewellery, Bags, Belts and Scarves.Casual and Evening Beaded Bags offered by us are of finest quality.Our Embroidered, Leather and Glass Beaded belts are widely appreciated in the Market.Along with that we offer Wood, Resign, Chain and Glass Beaded Necklaces Under Fashion Jewellery which are Trendy. We also provide Broaches, costume and Ethnic Jewellery under Imitation Jewellery are a class apart. Crochet and Embroided Scarves are available under Scarves.